Fernando Alonso's dominant season shuddered to a halt at his home Spanish Grand Prix as Kimi Raikkonen blitzed the field in his McLaren-Mercedes. 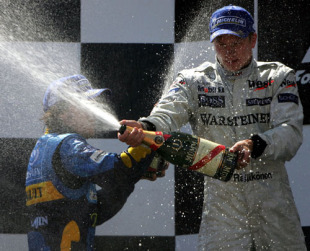 Raikkonen was never threatened in the race in Barcelona and almost lapped his team-mate Juan Pablo Montoya who had spun early in the race and then needed an extra refuelling stop when he was short-changed by a defective rig early in the race. Alonso's Renault was second, never having the pace of the McLaren and hampered by blistering rear tyres that needed TLC. Team-mate Giancarlo Fisichella was heading for third until he felt the car's downforce change. His pit stop was brought forward as the team checked the nose section of the Renault and sent him out, refuelled to the end, to finish in fifth place. That allowed Jarno Trulli up to third, chased by team-mate Ralf Schumacher who was just a length adrift at the flag with Mark Webber's Williams sixth behind Fisichella. Despite the disappointment, Alonso still headed the title race with 44 points to Trulli's 26.